Hi friends! 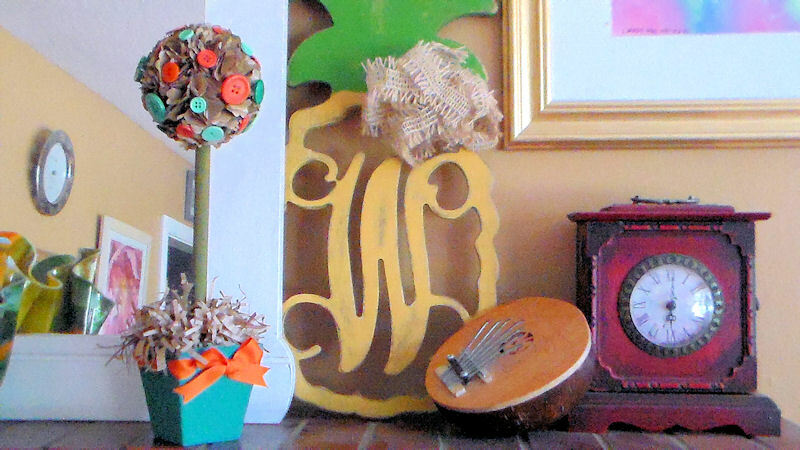 Today I have a fun and frugal project that will decorate your home for fall. I picked up a bunch of square peat pots for 5 cents each at a garden center, I don’t have a green thumb but I thought they could be cute painted. The “kissing ball” can even be used alone and hung from the ceiling for a party, Christmas or a wedding. Remember you are the crafter, you can make this project any color you like to match any décor! Watch the video to see how easy it was to make! 1. Paint pot and dowel. 2. Crumple kraft paper into a ball and secure with tape. Glue to dowel. 3. Cut strips of kraft paper and fringe edges to make the pot filler. 4. Punch circle from kraft and fold as shown in the video. 5. Glue the folded circles to the ball by the point. 6. Punch 4 holes on each side of the peat pot and weave ribbon in then tie ends in a bow. 7. Glue the end of the dowel into the pot and fill with marbles to stabilize the dowel and add weight to the topiary. 8. 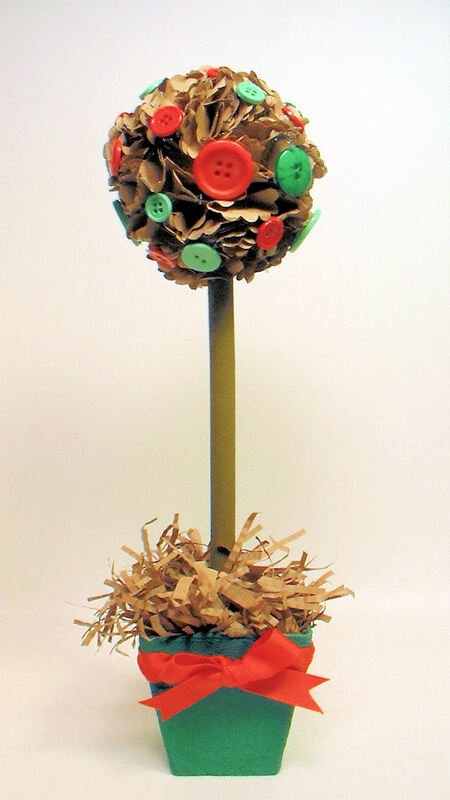 Add glitter and decorations to the top (kissing ball) of the topiary if desired. These are great to make in batches and you have my permission to make these and sell them (more money for craft supplies, right?) I want to thank Papermart for sponsoring this post and that YOU for visiting. Hey, if you liked this project please pin it on Pinterest (handy links below) or share it on your favorite social media. Until next time, happy crafting! Hi friends! I have a fun, fast and frugal project that will decorate your home all year-long. 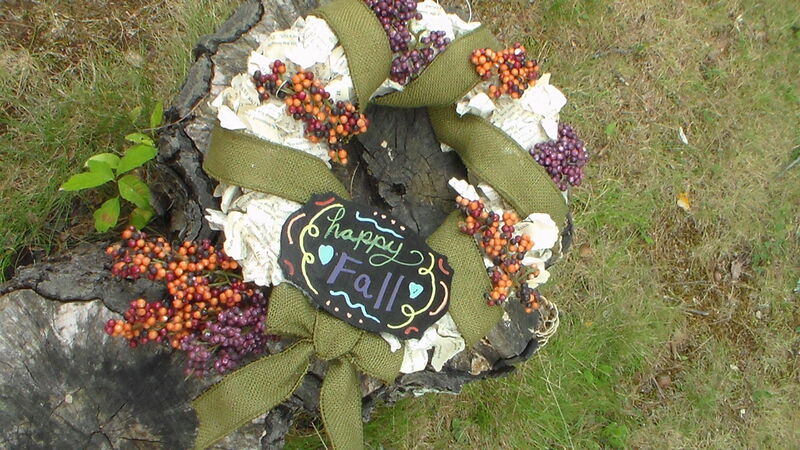 It is a DIY wreath with a plaque on it that you can write a seasonal greeting on and decorate to match any season because the colors are neutral. I made sure the plaque was glossy so that I could use my new Crafty Croc Liquid Chalk Markers on it and the writing would be easy to remove with a damp cloth. I will be giving an 18 color pack away to one lucky blog reader so make sure you leave a comment on this post for a chance to win! Also Crafty Croc giving my viewers $6 off the 18 color pack with the coupon code FRUGAL06 now through September 14, 2015. See how easy it is! I think they would sell really well at a craft fair (yes, you have my permission to make these to sell!) or be awesome housewarming gifts. All of the directions for making the wreath are in the video. It is really easy. If you can’t find a wreath form you can cut a ring out of cardboard and use that. Coffee filters would work really well in place of the die cut book pages too. Use what you have and experiment! I want to thank Crafty Croc for sponsoring this tutorial and offering the giveaway. Make sure you leave a comment for a chance to win a set of markers. I will draw a name at random next Monday. If you want to save $6 on the 18 pack of Crafty crock Liquid Chalk Markers make sure you use the coupon code FRUGAL06 before 9/14/15. Thanks for stopping by and til next time happy crafting!